On Sunday the protest by Gujjar community demanding five per cent quota in jobs and educational institutes turned violent in Rajasthan’s Dholpur district. The protesters fired shots and torched three police vehicles. As the protesters moved to occupy National Highway 3, they had a run-in with the police, which baton-charged to stop them. 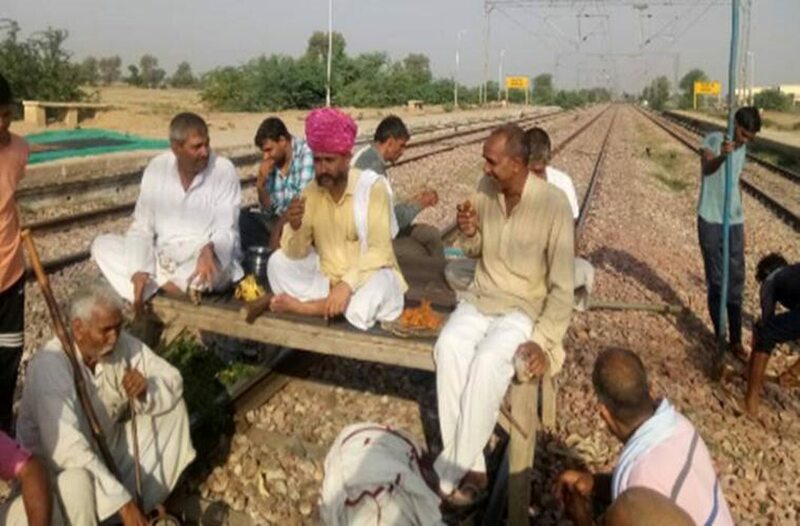 The leader of the community, Kirori Singh Bainsla, started a sit-in protest on Friday along with his supporters on the railway tracks in Rajasthan’s Sawai Madhopur district, demanding separate reservation for Gujjars, Raika-Rebari, Gadia Luhar, Banjara and Gadaria. This forced the West Central Railway (CWR) to divert, cancel or partially terminate nearly 200 trains in the last two days. Bainsla had said that reservation was promised by the government in its election manifesto. “We will continue the dharna on the rail tracks. No compromise was made with the government delegation. We want a 5 per cent reservation order,” Bainsla said.